A second Coffee Date Dress from guest blogger Jessi! Have we made it to a second date? I must warn you, this will probably be our last "date" together. While its been fun, I've really got to move on. There are so many other patterns out there! Once again, I used the BurdaStyle Coffee Date Pattern for this dress. As I mentioned before, the pattern is fairly easy, even for a beginner, and offers room for lots of modifications. Click here to read on and get your own big bow tutorial! Thanks, Jessi! 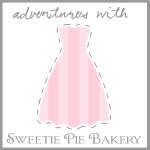 Readers, click here for more Adventures with Sweetie Pie! Very cute! The bow is a fantastic touch. Oh this dress is adorable! I love the bow! It adds so much! I tried the link for the bow and it's not working it can't find the site. I love this...i used this pattern three times when it first came out...my favorite version was turning it into a puffed sleeve blouse with a peplum.